THURSDAY, Jan. 7, 2016 (HealthDay News) -- A new imaging technique that "lights up" cancer cells may eventually help surgeons remove all of a cancer the first time, according to a preliminary study. "When a patient has cancer, the surgeon tries to find the tumor and cut it out," explained study senior author Dr. David Kirsch, a professor in the department of pharmacology and cancer biology, and the department of radiation oncology at Duke University Medical Center in Durham, N.C. "However, there can sometimes be microscopic residual cancer left behind that the surgeon can't see. "So this imaging technique," he added, "is meant to help the surgeon see the cancer during the operation, to avoid the patient having to go in for a second operation." The early trial, involving both mice and a small number of human patients, used a preoperative injection of a blue liquid called LUM015 directly into the region where the cancer is located. The liquid then spreads into tumor tissue instead of healthy tissue. According to the study authors, the liquid seeks out a particular enzyme called protease that is believed to be critical to cancer growth, and is found in large quantities in malignant cells. Once the tumor tissue is removed during surgery, a specially designed hand-held imaging probe is placed at the surgical site. Cancer cells left behind glow roughly five times brighter than healthy tissue, the researchers said. 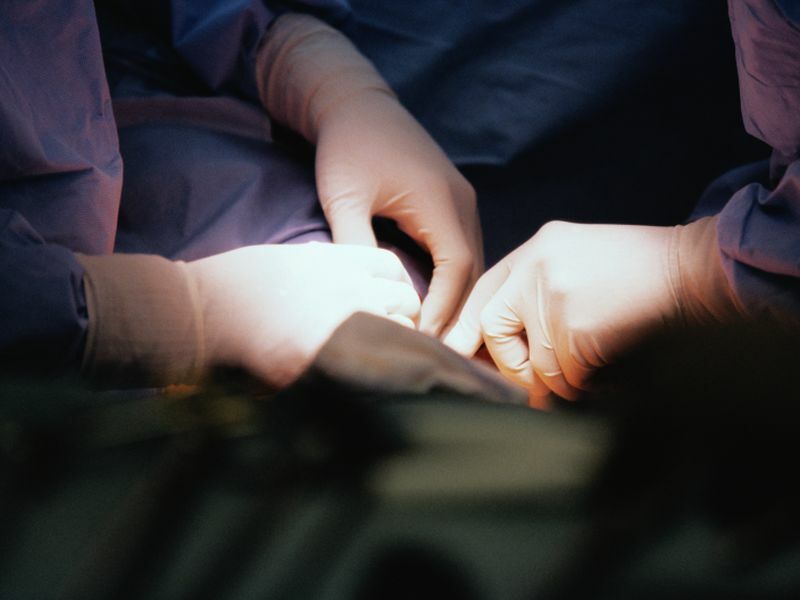 Surgeons can then remove the malignant cells on the spot, theoretically reducing the need for a follow-up operation. Dr. Stephen Freedland, director of the Center for Integrated Research on Cancer and Lifestyle at Cedars-Sinai Medical Center in Los Angeles, noted that one of the biggest challenges facing surgeons is determining where is the cancer. "So better imaging is always needed. Because with a big, massive tumor it's easy to see the cancer. But when it's just a few cells or a small tumor, it's very hard to see and properly target therapy," said Freedland, who was not involved with the study. "But if this [experimental approach] pans out, which is still a huge 'if' at this point, it holds the promise to do that," Freedland added. "I do think using these little enzymes, these protease, to tell us where the cancer is absolutely does make sense. And in theory this concept should work for the vast majority of cancers. So although it's at a very early stage, there's a lot of promise here. And hopefully they [the study researchers] on the path to something great." The new technology was developed through a collaboration between Duke, the Massachusetts Institute of Technology and Lumicell, a company started by the MIT researchers, involving Kirsch. Findings from the study were published online Jan. 6 in Science Translational Medicine. The researchers say theirs is the first such approach to specifically use the protease enzyme to guide imaging. To date, the study has involved research with mice and a group of 15 patients, all of whom were diagnosed with either breast cancer or soft-tissue sarcoma. With human patients, the research team has so far studied the fluorescent impact on tumor tissue already removed from each patient. Among mice, the team has performed real-time removal of cancerous cells based on identification by the technique. The study authors said the technique has produced no side effects and appears safe. A follow-up trial involving 50 breast cancer patients is already underway, and Kirsch said the hope is to make the technology available by 2017. Dr. Lisa Richardson, director of the U.S. Centers for Disease Control and Prevention's division of cancer prevention and control, said the reason people are living longer after a cancer diagnosis is "because of advances in early detection and treatment." "[And] a complete and accurate diagnosis of cancer at the time of surgery is always the goal," she said. "Any new technique to improve cancer diagnosis is a step forward to help improve the desired outcome: eliminating cancer for an individual and improving their chances of surviving. This new technique may help surgeons be sure that cancer is completely removed during the procedure. If it pans out, the need for additional surgeries will also be decreased."